Unlike French patissiers like Herme, Stephane Glacier and Christophe Felder who continually contest and astound tastebuds around the world by creating every thinkable sweet and savory flavour using exotic ingredients like foie gras, caviar and truffle, others like Aoki remain rooted with the basics and yet tap deep into his Japanese origins to develop new but yet otherwise familiar macaron flavours like matcha (green tea), yuzu (Japanese citrus), kurogome (black sesame) etc, just to name a few. Well, familiar to us at least. And in recent years, he extended his repertoire by looking into other flavours from the Orient like ume, wasabi, genmaicha and houjicha. Astounding in his own ways I’m sure! 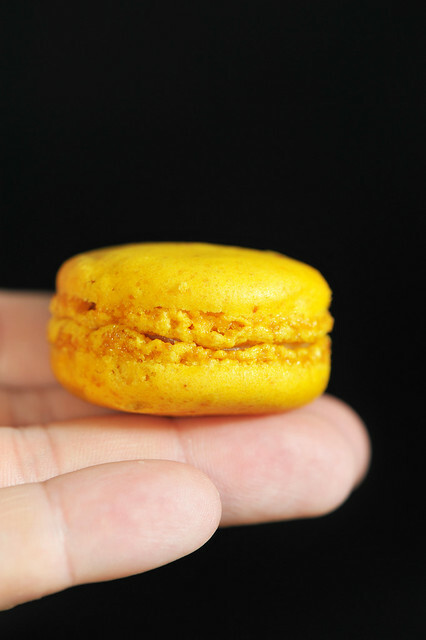 Macaron citron, a very basic and common flavour. Which makes it all the more challenging to get it right! And to get it right he most certainly did! The lemon flavours shine through the piece, being incredibly tart and tangy! Lemon as what a lemon should be! Subtlety is most certainly not something one would find in this flavour and I’m most certainly glad he did! It is also incredibly aromatic, most probably from the use of lemon zest, or perhaps even lemon compound. Whatever the case, this is really delicious and my only regret is getting only one piece and not one whole box of it! If one was to nitpick, it would be the shells which seem to have become deformed, and it is entirely my fault!!! 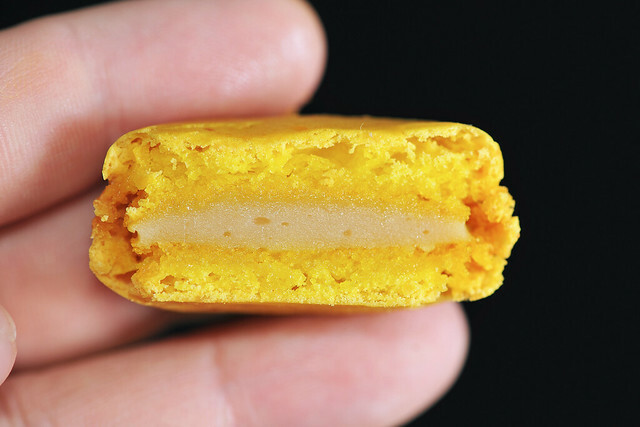 Owing to the maturation process of the macaron, moisture from the filling would diffuse into the shells causing them to soften, modifying the overtly dry textures of freshly baked macarons. The service staff over the sales counter at Formosa Regent did caution us not once or twice, but thrice(!) that the lemon buttercream filled ones would be more fragile compared to the others and hence only one piece was placed on display while the others were tucked in the freezer and only taken out on demand. Thus, it is thus best to be consumed immediately when the macaron is returned to room temperature and no later than that. All the macarons at the Taipei joints are “matured” as they were air-flown in from France and not made in situ in Taipei. So are the chocorons and bonbon macquillage and the rest of the chocolate works. The other flavours travel really well with the shells remaining rather crisp despite the other half a day journey around Taipei doing last minute shopping and the flight back home. It is most unfortunate that this macaron chose to be less forgiving than the others.Another one which we had slight problems with in terms of transportation was Macaron Framboise, which was filled with confiture. Its shells too yielded under the permeation of moisture and became a tad too soft, which would otherwise epitomise the makings of a perfect macaron. Alas, now we know. But the flavour is incredible and we would most certainly have no qualms in trying it again. But definitely in store, as what the sales lady had initially suggested, advised and cautioned. I should have listened. 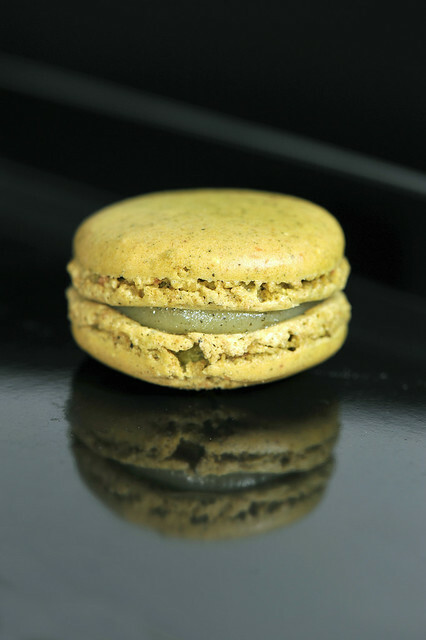 Macaron pistache, with aromatic nutty tones from the pistachio infused shells. Another buttercream piece, a base filling which I have an apprehension of being too cloying. But Monsieur Aoki worked really well to dispel that fear, partially because the macaron was “underfilled” by Pierre Herme standard. But this most certainly doesn’t work against Monsieur Aoki in any way! Another general remark made by most folks who’d tried macarons is their level of sweetness being unruly and somewhat brutal. 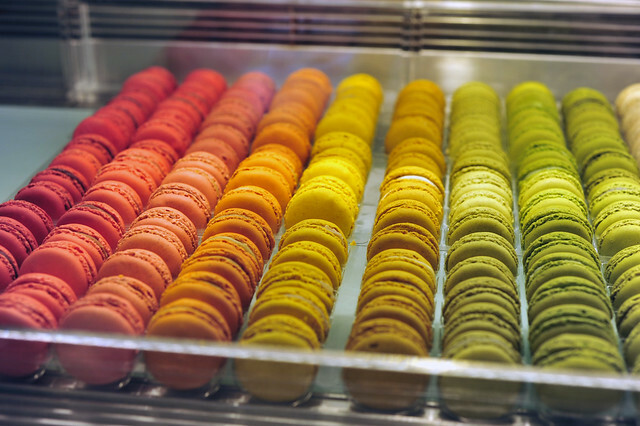 In times of such when commodity prices have scaled and rocketed, the faux generosity of sugar in macarons seemed unchecked and almost perverse. But thankfully, Monsieur Aoki’s macarons have none of that! His macarons are not sweet! And for all who are empathic would know that I mean it in a good way! The shells have turned somewhat brown after baking, as the pistachio flavour shells merely borrowed their colors from the ground pistachio meal and perhaps pistache pate used. Though they may not be aesthetically as pleasing as the others packed with artifical (read: carcinogenic) coloring, their true colors are revealed, quite literally, upon slicing through! 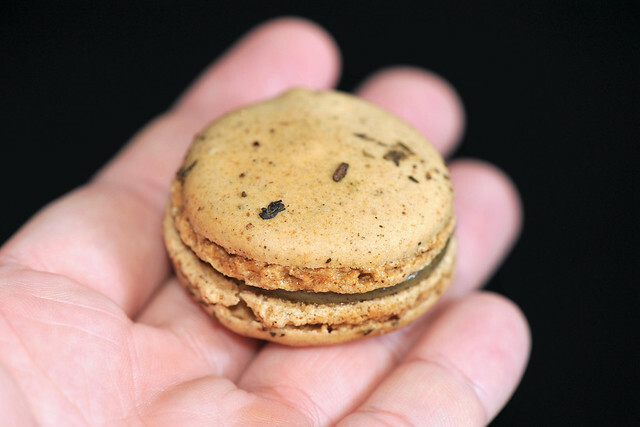 Macaron Houjicha, one of the few tea-infused flavours developed by Monsieur Aoki over the years, alongside matcha and genmaicha. 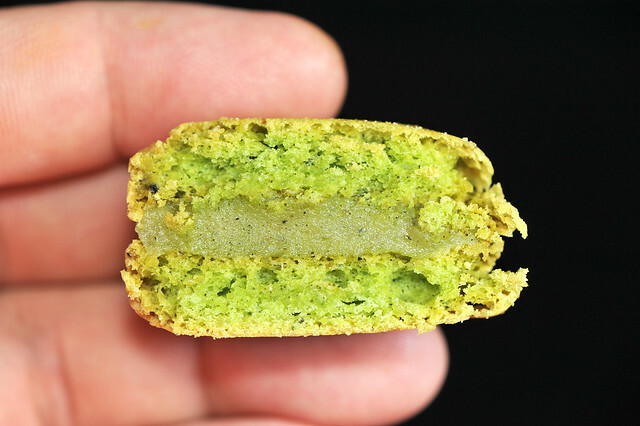 Its flavours are lovely, especially from the hints of bitterness from ground tea leaves incorporated into the macaron pâte as well as the embellishment of more tea leaves on top. 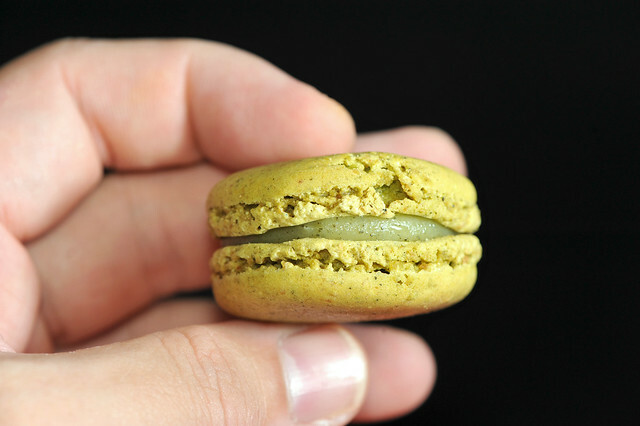 Like Macaron pistache, the shells are free of food coloring, providing a rustic outlook. The combination of houjicha-infused buttercream reminds much of Earl Grey au lait, but with more intensity and depth. Like the earlier buttercream filled pieces, the texture and taste of buttercream is not apparent, merely serving as a vector for the houjicha. And I must say Kudos to Monsieur Aoki for achieving that level of dexterity in the art of buttercream, taking away most of its heft and cloyiness, and most certainly changing my impressions of it! Til the next instalment of Aoki reviews, Merry Macaron Day!!! This entry was posted on March 20, 2012 by Alan (travellingfoodies). 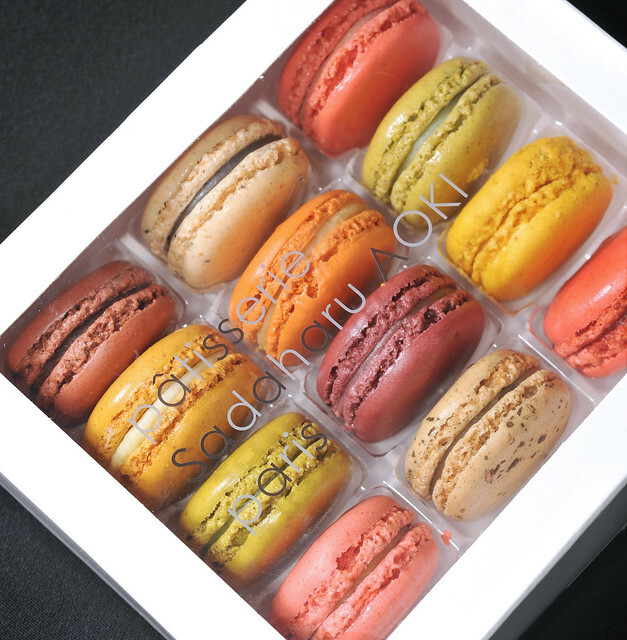 It was filed under Food, Travel and was tagged with citron, french pastries, houjicha, lemon, macarons, patissier, pâtisserie, pâtisserie Sadaharu AOKI paris, pistachio, sadaharu aoki. I can’t remember the prices of boxed ones though…. But i do know each piece is NT 90!!! Damn bloody ex… Can easily eat a 排骨便当 at NT 60 plus 2 side dishes at NT 20, or almost 5 bowls of 鲁肉饭 at NT 20 each! I wonder how he does his buttercream? 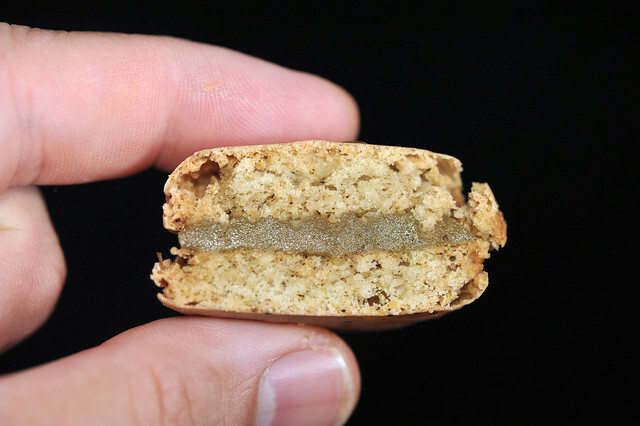 Did you happen to get the recipe for the houjicha macarons? Matcha seems easier because it’s powder. Any other tea would have to be liquid (I think) so that could throw off the proportions a bit. Have you tried making any tea flavored buttercream? Maybe ganache would work better? yes, ganache would be easier to boil the cream with tea leaves and let it infuse for 10-15 mins and then top up the cream to original quantity. But buttercream shouldn’t be that difficult too. It can also be done on buttercream. Same rationale to boil tea leaves with syrup before making buttercream. hahaha you go there and see lor..